Long in the way time past time, rabbits had very short ears. They had very long tails. They had long, straight arms and long, straight legs. Very different than the way rabbits look today. So Rabbit decided to eat some of the grass and play around. But he thought to himself, “I would like to play in the snow.” He remembered that his grandmother told him that if you can wish for something hard enough it can happen. So Rabbit started to wish for it to snow and he started to dance. 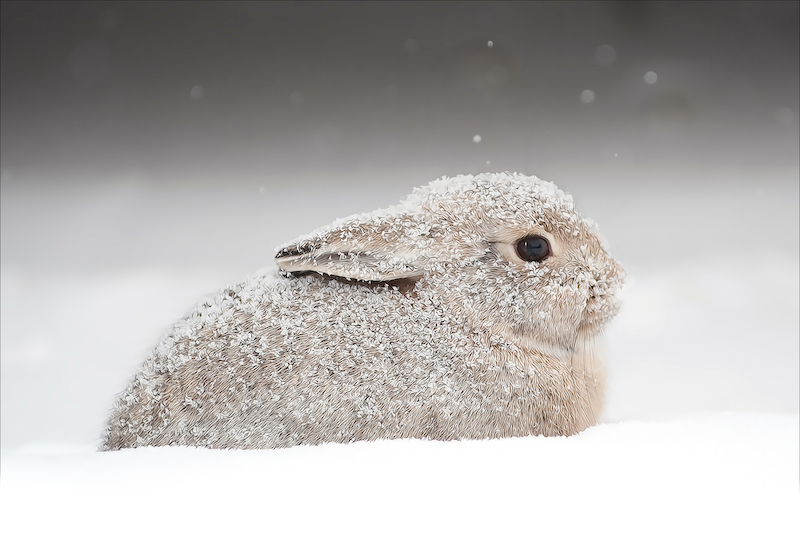 And he started singing his song, “Oh how I wish it would snow; Oh how I wish it would snow.” And as Rabbit danced and prayed and sung his song, it started to snow a little bit. Oh, this made Rabbit so happy that he sung his song stronger and harder. “Oh how I wish it would snow; Oh how I wish it would snow.” And the snow started to come down. And Rabbit was so excited to see that snow coming down that he sung his song stronger. “Oh how I wish it would snow; Oh how I wish it would snow.” And it started to snow so much. And because he wished for it to snow so much, the snow rose higher and higher until it rose high into that willow tree. And now Rabbit played in the snow, and now it was so high he could eat some of those fresh shoots that were in the willow tree. He filled his stomach. He awoke the next morning and the sun had come out and melted all that snow away. Now, Rabbit was high up in that willow tree, wondering how he was ever going to get down. Because as you know yourselves, rabbits are not good tree climbers! So as he was holding onto those branches and looking and wondering how could he get down, how could he sing his song again, how could he make it snow? As he was leaning over, SNAP! His tail broke! And when his tail broke he went tumbling down out of that tree. And as he tumbled down out of that tree, his little short ears would get caught in the branches and stretch and stretch and pull and pull until they were as long as they are today! And when Rabbit fell out of that willow tree, he hit that ground so hard his long, straight arms shot into his body and became little, short arms just like they are today. And when that Rabbit fell out of that tree, he hit that ground so hard his long, straight legs broke and bent just like they are today. And when that Rabbit fell out of that tree, he hit that ground so hard, he split his lip. Now, you know that this is a true lesson. Because if ever you were to look at that Rabbit today, or any of his grandchildren, you would see that they all have long ears, little short arms, bent rear legs, a split lip, no tail, and they have to hop everywhere they go. Any springtime, you can go out into the park or into the woods and look up in that willow tree. And when you look up into that willow tree, you will see where Rabbit has left his tail. Because that willow tree has a very special look. And today that willow tree and Rabbit both look different.